The Central Arbitration Committee have issued the official notice of the Boots ballot. This legal notice must be displayed in all workplaces where eligible voters are based and includes instructions on what to do if you do not receive ballot papers. 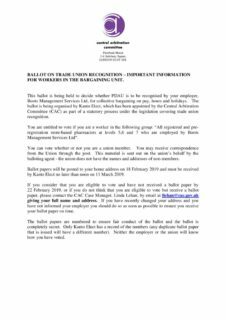 “BALLOT ON TRADE UNION RECOGNITION – IMPORTANT INFORMATION FOR WORKERS IN THE BARGAINING UNIT. This ballot is being held to decide whether PDAU is to be recognised by your employer, Boots Management Services Ltd, for collective bargaining on pay, hours and holidays. The ballot is being organised by Kanto Elect, which has been appointed by the Central Arbitration Committee (CAC) as part of a statutory process under the legislation covering trade union recognition. You are entitled to vote if you are a worker in the following group: “All registered and pre-registration store-based pharmacists at levels 5,6 and 7 who are employed by Boots Management Services Ltd”. You can vote whether or not you are a union member. You may receive correspondence from the Union through the post. This material is sent out on the union’s behalf by the balloting agent – the union does not have the names and addresses of non-members. Ballot papers will be posted to your home address on 18 February 2019 and must be received by Kanto Elect no later than noon on 11 March 2019. If you consider that you are eligible to vote and have not received a ballot paper by 22 February 2019, or if you do not think that you are eligible to vote but receive a ballot paper, please contact the CAC Case Manager, Linda Lehan, by email at llehan@cac.gov.uk giving your full name and address. If you have recently changed your address and you have not informed your employer you should do so as soon as possible to ensure you receive your ballot paper on time.